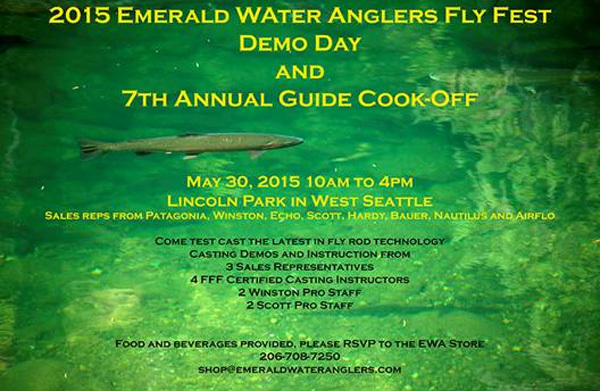 Emerald Water Anglers is taking their Guide Cook-Off to a new level. Join them at Lincoln Park on Saturday, May 30th for this 7th annual event to test some fun products, learn some new skills, and of course–eat some good food. They have arranged for the Winston, Scott, Hardy, Echo, Patagonia, Bauer, and Nautilus sales reps to all be on hand with the full array of products for people to test cast with. The pro staff and FFF certified casting instructors will also be on hand to provide free casting instruction to anyone who would like to hone their skills a bit before the summer really kicks in. They will also have a line up of the Epic Glass rods from New Zealand on hand to test cast as well. The cook-off, for those who haven’t been to it before, features the Emerald Water Anglers staff competing against each other for the best shore lunch they can whip up. They can spend $40 and have 30 minutes to make enough for 3 people. Plates will be judged by a panel of food experts as well as the attending crowd.